Used car king Cal Worthington has long said "I will stand on my head to beat anybody's deal." Then again, he's probably never met Assy McGee, who's already got the bottom's up advantage. Becky tired! Becky head hurt! Becky post WWE pic and call it a night! 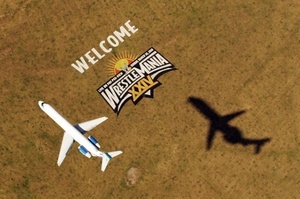 As a part of the local hoopla for WrestleMania XXIV, WWE secured a football field-sized logo in a field adjacent to the airport approach in Orlando. 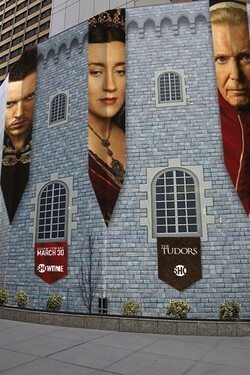 To launch the second season of The Tudors, Showtime Networks transformed New York's Sheraton Towers hotel (52nd & Seventh Ave.) into a replica of a castle and the Royal Court of King Henry VIII for the premiere party on Wednesday, March 19. A mesh vinyl wrap serves as the castle's stone façade. The interior was designed after the Royal Court's den of iniquity with burgundy, velvet-wrapped boards and columns alongside images of the cast. One Source Visual Marketing Solutions' OS39 Creative was the design agency. The façade will stay up for three weeks. The show's new season premieres March 30. It is suggested that one shouldn’t discuss religion or politics at the Thanksgiving dinner table, but as far as IFC knows, these topics are fair game at a film festival, a university hall or a meeting of the local Rotarians. 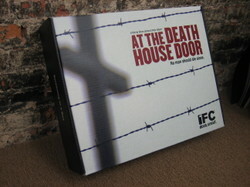 To create a groundswell of interest in death penalty documentary At the Death House Door, the Independent Film Channel is offering “Screening in a Box” kits, which contain all the fixins for organizing a viewing party and follow-up discussion. The doc profiles Rev. Carroll Pickett, a Presbyterian minister who spent 16 years as the chaplain of a Texas State Prison, where he accompanied the first 95 inmates to the execution room after the death penalty was reinstated in 1977. The kits, which are available to political, religious, educational and other groups, contain a DVD of the film, postage-paid invitations, promotional posters, planning tips, discussion guides, snack vouchers, customizable press releases and a sample letter to the editor of a newspaper. Enclosed postcards promote tune-in for the IFC airing on May 29. Interested groups can also download the screening materials at a Web site. Partner organizations include the ACLU, Amnesty International, The United Methodist Church, Stanford School of Law, University of Georgia, Church Women United and Tennessee Coalition to Abolish State Killing. “The goal is for IFC to be a platform where the death penalty discussion can be had,” said Jennifer Caserta, evp-marketing, communications, scheduling and alternative platforms, who expects to reach about one million people with the effort. Marketing agency Civic Entertainment Group, New York, helped implement the program. In special hearings on punishment, capital, in state capitals, such as Austin, Raleigh and Sacramento, IFC will invite community leaders to view film clips and discuss such issues as wrongful convictions and lethal injection. Since the state is a “star” of the film and is well known as a convict kill mill, IFC decided Death House should premiere in Texas, too: On March 9, the film debuted at SXSW. We [heart] street campaigns that incorporate existing functional structures. 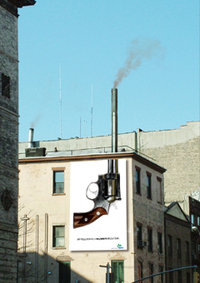 This ad for the Natural Resources Defense Council was created by Jeseok Yi, a student at New York's School of the Visual Arts. From April 7– 18, the Art Directors Club will showcase work by Yi and his SVA classmates tackling issues such as America’s dependence on oil, environmental pollution and accessibility for the disabled. The exhibition is free and open to the public weekdays during business hours. Public reception: Wed., April 9, 6-8 p.m. When Times Square gets invaded by giant lizards, that means one of two things: Either the folks at Pepsi are extending SoBe’s Super Bowl ad message or J.J. Abrams is filming his next oh-so-mysterious, jiggly handycam epic. On March 19, it’ll be the former, as the “Thriller”-loving lizards take on the tourist mecca via 18 video screens for a 24-hour period to promote SoBe Life Water. The boards where they will boogie include those owned by Reuters, NASDAQ and ABC. 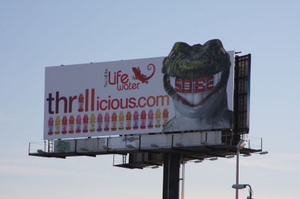 A static billboard featuring a Lizard with a SoBe-bejeweled "grill" (right) will stay up on 7th Ave. and 47th St. long after the stunt. The Arnell Group, New York, is the ad agency. After Broadway, the “Thrillicious” campaign will hit the road—billboards are planned for Los Angeles, Chicago and other markets over the coming weeks. The Life Water Super Bowl spot, in which lizards and supermodel Naomi Campbell get down to the Michael Jackson tune, has been viewed online more than 5 million times, Pepsi said. Last year, the U.S. Postal Service's blue mailboxes were outfitted to look like R2D2 for Star Wars' 30th anniversary. This year, for HBO’s John Adams miniseries, it’s what’s inside that counts. The “Power of the Letter” promo is running in about 13,000 post offices and at www.poweroftheletter.com. There, one can enter a sweeps to win a trip to Colonial Williamsburg and follow a few steps to customize and snail mail a letter for free (yes, just like on the Internets!). Civic Entertainment Group is the agency. Other 21st Century twists include a special cancellation ("Let us dare to read, think, speak and write") that will go on 3 billion pieces of mail this spring, and a marketing message (a quote from Adams, and the promotional URL) on receipts—a Postal Service first. Adams and his wife, Abigail, exchanged over 1,100 letters over the course of their courtship and marriage. 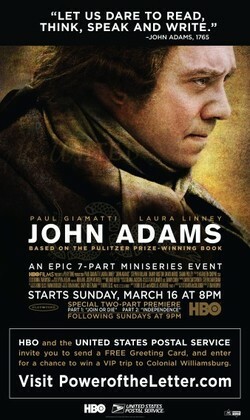 David McCullough relied heavily on these missives to write John Adams, the biography on which the March 16 miniseries starring Paul Giamatti and Laura Linney is based. HBO also hyped the miniseries with an outdoor teaser campaign, in which the revolutionary call-to-action "Join or Die" was declared in a vintage script. Our fave: The "Join or Die" bus bench parked right in front of Los Angeles' Scientology building.